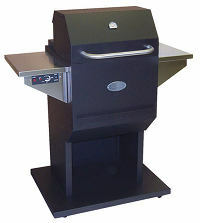 Colonial BBQ Grills are made by Louisiana Grills who also make The Louisiana Grills "Country Smokers" range. Louisiana Grills are a division of the Danson Group who produce the Pelpro range of pellet stoves and a wide range of wood pellets. Colonial grills feature a double walled cooker hood which insulates the cooking area and allows more controllable cooking, specially in cool conditions. All have automatic ignition and a thermostat in the cooker hood as well as a switch tthat allows hot smoking at 200 degrees with just the press of a button. All except the 'Kentwood stainless' come with the 'flavour guard' grate which is made of stainless steel and is designed to catch and vapourise the cooking juices. 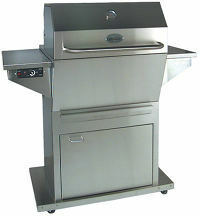 The 'Kentwood stainless' has the 'grillmate' cooking grate which is coated with platinum and acts as a catalyst. The catalyst allows grease to burn at a lower temperature which produces smoke rather than flame. Cooking area 204 sq. ins. Available either in black or in stainless steel. 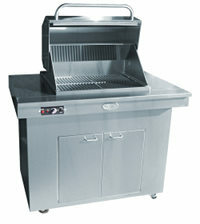 The Stainless version comes with the 'grillmate' cooking grate. Cooking area 408 sq. ins. Available either in black or in stainless steel.